Unrefined walnut oil is made from nuts that are dried and then cold-pressed. Good quality walnut oil is topaz in colour with a rich nutty taste. Walnut oil has a limited shelf life, about 6-12 months. Once opened, all nut oils should be kept in a cool place out of the light or refrigerated to prevent them from becoming rancid. Several medical studies have conducted research that indicates that walnut oil offers a rich source for antioxidants, specifically ellagic acid. This antioxidant has been found to detoxify several substances linked to the development of certain cancers. In addition, ellagic acid also helps to obstruct these cancer cells from replicating themselves. 1) Improves blood circulation: Walnut oil contains high levels of monounsaturated oils such as omega 9 which help to keep your arteries supple. The flexibility of the arteries promotes the flow of blood free of any hardening leading to hyper tension and heart disease. 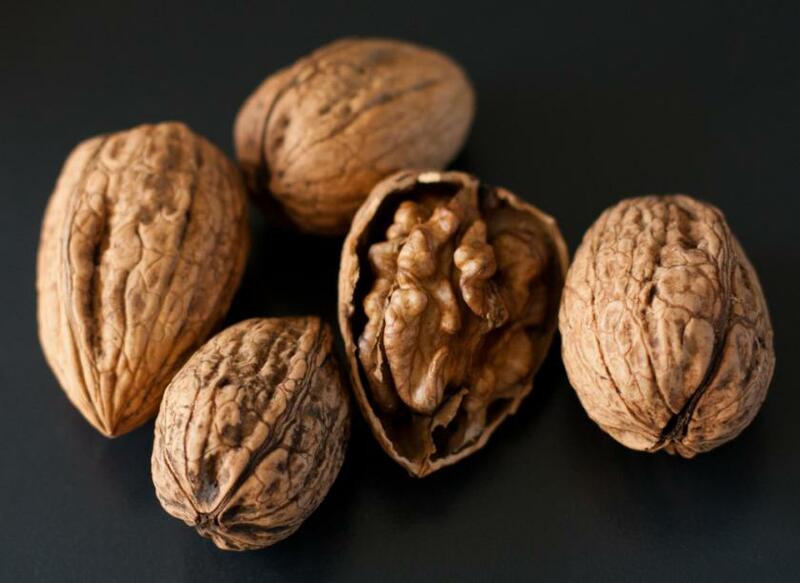 2) Lowers heart disease risk: The cardio-protective benefits of walnut oil come primarily from the high concentration of alpha-linolenic acid (ALA), which is an omega-3 fatty acid that ultimately is converted to eicosapentaenoic acid (EPA), and docosahexaenoic acid (DHA) A Yale University study in 2009 found that consumption of walnuts in daily basis may improve the health of blood vessels, thereby decreasing the risk of heart disease.3) Cuts inflammation: Walnut oil has also high levels of polyunsaturated oils like omega3 and omega 6 which help to reduce inflammation and helps prevent diseases like arthritis.4) Maintains hormone levels: Walnuts are rich in phytonutrients and are an excellent source of selenium, phosphorous, magnesium, zinc, iron, and calcium that are helpful in stabilizing body hormones.5) Improves skin: Walnuts and/or walnut oil provide hefty levels of vitamins B-1, B-2, and B-3, coupled with vitamin-E and niacin. Certain phytonutrients and fatty acids in walnut oil can contribute enhancing the texture and quality of the skin.6) Prevents eczema: A couple of teaspoons a day of walnut oil can be beneficial for people suffering from the skin rashes called eczema.7) Anti-ageing: Walnuts and walnut oil are also rich in antioxidants and among the best sources among tree nuts. Antioxidants are substances that counter the effects of free radicals that cause cell damage and accelerate the aging process.